Affix labels, scratch-offs, holograms, windows, laminates; create integrated cards and labels. 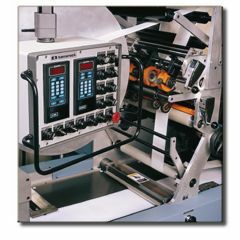 Off-line equipment configuration is well-suited to business forms finishing operations. 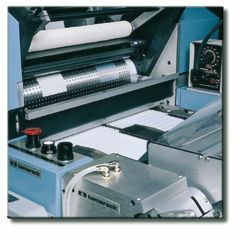 The Tamarack Versa-Web® M500 is an off-line machine that feeds a roll of material to length, cuts off, and affixes the patch in registration onto the carrier web. The Versa-Web offers excellent +/- 1/32" (.5 mm) registration and speeds up to 500 ft/min (130 m/min). The equipment's follower drive system allows the use of other finishing equipment for added versatility. The Versa-Web M500® includes a feed unit, vacuum applicator and cut-off unit, and integrated die cut unit as standard features. Options include a hot melt unit, additional unwind, and integrated card gantry. Cut-off and affix a wide variety of materials--any material that will conform to the 24" circumference vacuum cylinder. Materials are affixed at carrier web speed, resulting in +/- 1/32" registration. Material is routed by the feed unit to the vacuum applicator cylinder, which also serves as the anvil cylinder. A changeable cut-off cylinder (tooling which matches the carrier web repeat) cuts the patch to length. The vacuum cylinder - the heart of the unit - utilizes over 1800 vacuum holes and a 10 hp vacuum blower motor for positive control of the cut patch. The patch is married to the carrier at web speed, resulting in excellent registration. 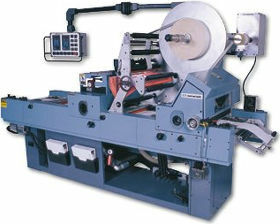 Mount rolls up to 30" in diameter of labels, laminates, windows, and other materials. Materials may be converted (such as die-cut, matrix-removed labels) or uncoverted (such as polyester films). The feed unit uses an independent servo drive to control the unwind speed of the material. Your operator enters the desired patch length using a convenient keypad (patch lengths from 1.000" to 10.000" are available); the feed unit drive enables patch length changes "on the fly" for fine adjustment. An optical scanner is available to register preprinted and other converted materials. The feed unit routes materials to the vacuum applicator and cut-off unit. Apply hot melt, pressure-sensitive adhesive (PSA) to labels, laminates, and other materials to reduce cost. The hot melt unit applies adhesive smoothly and precisely, coating materials with PSA in thicknesses down to .0005", to achieve material cost savings. Two-ply labels, for example, can be coated with PSA, cut-off, and affixed to the carrier web, saving 50-60% of the cost of three ply, "piggy-back" labels. 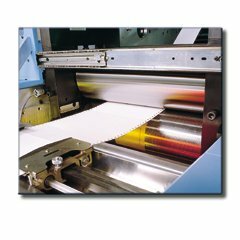 Similarly, release liner coated with hot melt PSA offers cost advantages compared to transfer tape for the production of integrated labels for medium to long production quantities. The hot melt unit utilizes a keypad entry for patch size, with coating heads available in 12" and 18" widths. Die cut the carrier web to produce integrated labels and integrated cards. 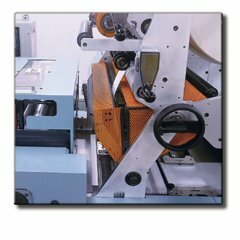 The integrated die cut unit provides selective-depth die cutting to produce integrated products. Utilizing the unit's variable center distance feature, your operator makes accurate depth adjustments in one ten-thousandth inch increments - enabling the production of integrated labels and cards with thinner liners, which improves stacking and feeding in laser printers. Integrated cards with top laminates, positioned two wide across the form, are die cut reliably due to the unit's rigidity and precision manufacture.